Hard type wire (1000N/Sq.mm)Annealing technology assures a stable tensile strength, preventing wire breakage. Breaking Load (N): 48.2 Min. Straight wire free from twisting or deformation. The wire is very much suitable for machines with automatic wire threading (AWT). The material used is of high purity. Wrapped by Anti-Rust paper and plastic film to avoid oxidation and corrosion. SANKI wire is manufactured using advance Japanese Fine Drawing Machines in clean, constant temperature and humidity controlled atmosphere. SANKI WIRE is available from Ø 0.10 to 0.30mm. SANKI WIRE is suitable for all International make and Indian make CNC WIRE CUT EDM. 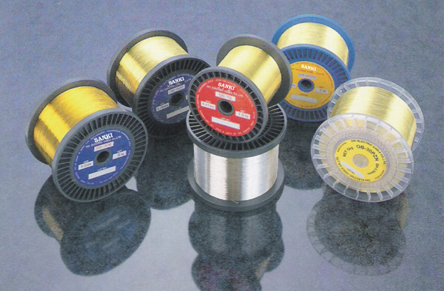 SANKI EDM brass wire is economically priced. Ø 0.25mm brass wire in 5kg spool is available in stock.